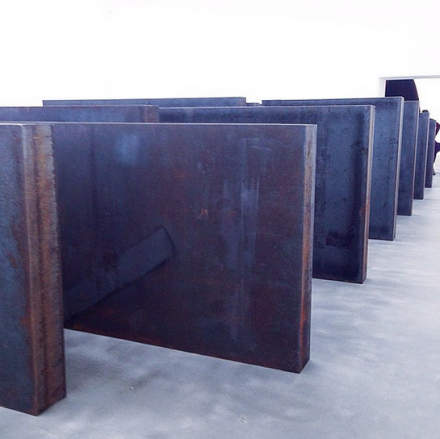 Richard Serra has had a strong showing in the past months. The 74-year old artist closed out a pair of wildly praised exhibitions at Gagosian New York late last year, and followed it up with a lifetime achievement award this year from Americans for the Arts. The New York-based artist is bringing a series of new works to Gagosian’s London locations on Davies Street and Britannia Street, offering a concise look at the artist’s current aesthetic interests. The new work extends a strong continuity towards Serra’s most recent projects. Combining his steel sculptures into ever more confounding and demanding structures, the series of works on view, particularly Ramble, allows a certain understanding of both structural force and perception, using quickly varying columns to resemble a flowing, rolling series of hills. The environmental, almost naturalistic reference points in the work here is notable, reduced to a series of high and low points through his steel interventions. At the same time, Serra’s work has always been able to do more with less, and his other works on view make the most out of a limited number of parts. 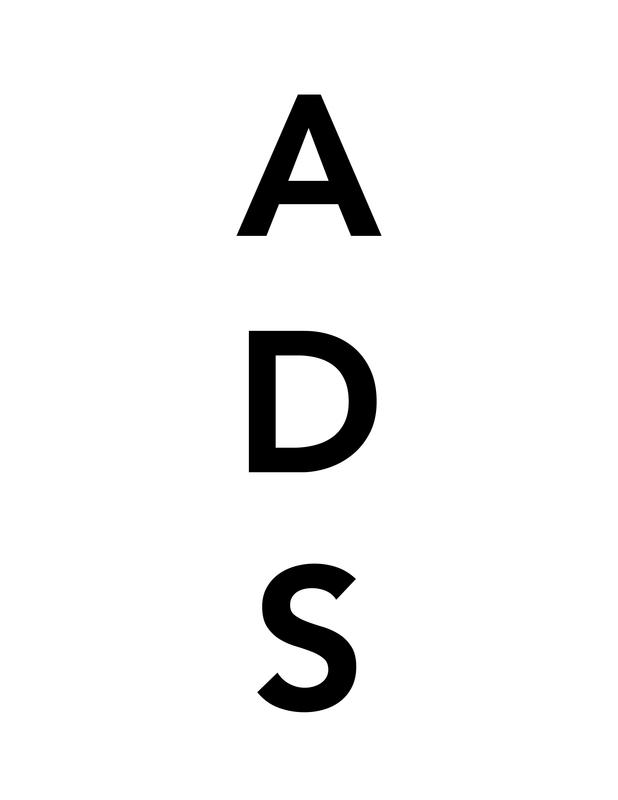 Dead Load, for instance, takes much of its strength from the subtle difference in scale and size that his two pieces play off against each other. Even with little to go on, a certain oppressive narrative gradually makes itself felt through the work. 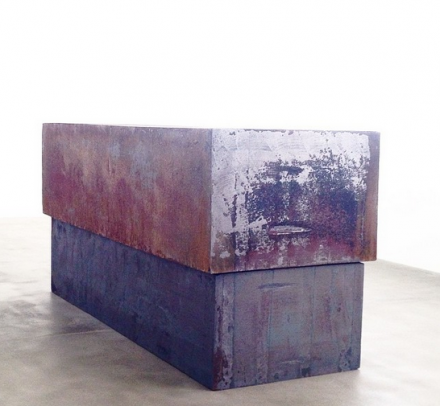 Similarly, London Cross continues Serra’s interest in the equally precarious, threatening and commanding nature of steel arranged in space. The artist’s enormous sheets are arranged on top of each other, creating an intersecting pair of vectors stuck somewhere between a formal investigation of space and an imposing optical illusion. At the intersection of these dual interests in Backdoor Pipeline, one of Serra’s monumental sculptural works inviting the viewer to pass through its enormous, ruddy pathways, changing notions of interiority and exteriority as the viewer moves from one end of a tunnel created only from a pair of slightly bent and twisted sheets of steel. Working against the massive sculptures that on view at Britannia Street, the artist is also presenting his 2011 work Double Rift #2, a large-scale monochromatic paintstick piece on paper. Executed in a stark, ominous black, the work’s surface nevertheless allows a nuanced experience of the artist’s hand as it engages in the execution of the work. Certain sections of the work belie a continued focus from the artist, creating a work that unfolds with the viewer’s continued viewing. Combined with the two sets of breaks that divide the work, the piece seems to place little emphasis on its surface other than on the forces and series of movements that gradually formed it, as if the artist sought to work in a manner that slowly eliminated his own decision-making in favor of the continuous layering of paint. 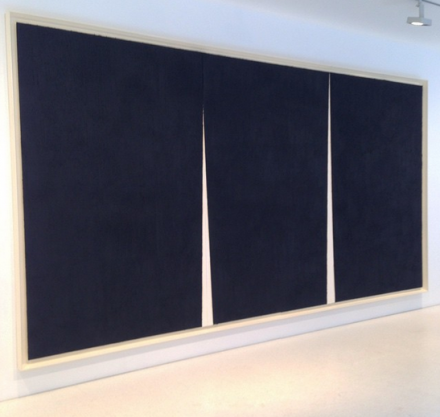 Serra’s exhibitions are on view through November 22nd (Drawing) and February 28th (Sculptures) respectively. This entry was posted on Sunday, November 16th, 2014 at 12:00 am	and is filed under Art News. You can follow any responses to this entry through the RSS 2.0 feed. You can leave a response, or trackback from your own site.